In order to draw comics, you need to learn to draw the heroes of these comics. 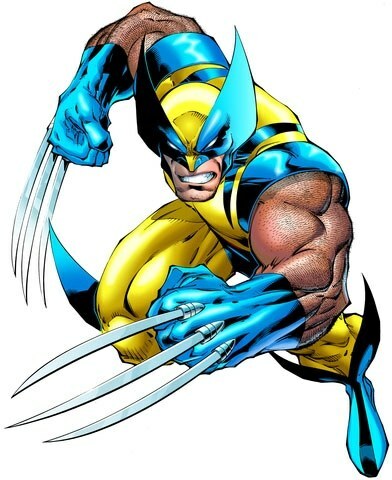 Try to draw one of the characters invented by Marvel comics – Wolverine, a mutant with superhuman powers. a sheet of paper, a pencil, a eraser, the helium black pen, markers or gouache. Place a piece of paper vertically to fit. Using a lead pencil complete the sketch of the main parts of the body. Small circle – the head, underneath uneven oval – chin, large oval – tors of the character, a strong hand in the form of semi-ovals, triangular area, the pelvis, also half-ovals. On the face of the character on the chest indicate the middle line, it will help you in the orientation in the figure. Start the drawing. On the head, around the eyes, create "wings" masks of a superhero. Then begin drawing the muscles of the arms and chest, gradually descending in the drawing below. Draw the "mask" of the eye (a narrow slit), under it – the mouth (twisted anger), draw the chest muscles. Waist draw strap. Draw the fingers clamped into a fist and steel claws emerging from his knuckles. Each hand has three pieces. The fingers of the left hand pririsovyvat sharper as it is closer to us. To have a good and plausible to draw the muscles of the body – examine the drawings of this character on the Internet. Also it would be nice to see the human anatomy, pictures and way of drawing. Now draw the details of the lower part of the character. It's muscular legs and boots. Please note that the boots of the hero have small "wings". Stop the hero is an ordinary, without heels. Left leg pririsovyvat sharper as it is closer to the viewer. Now with the eraser tool erase unnecessary construction lines. Black helium handle can make the outline of the character and proceed to its coloring after drying the paste. Colored materials can be gouache or markers, because for comics it is better to use saturated colors. Shoulders, gloves, and "pants" and boots color a rich dark blue color. Other details of the costume, lemon or yellow, glabrous leave only the lower part of the face and hands. Wolverine is ready!